Three Chinese astronauts blasted into space June 11, 2013 on the nation's fifth manned space mission. A Chinese rocket roared into space Tuesday (June 11) carrying a crew of three on their way to the nation's space module orbiting Earth. The trio of astronauts — two men and a woman — blasted off aboard their Shenzhou 10 spacecraft toward the Tiangong 1 module from the Jiuquan Satellite Launch Center in the Gobi desert at 5:38 a.m. EDT (9:38 GMT) — 5:38 p.m. local time. The Shenzhou 10 crew is set to dock with the Tiangong 1 module (also called the Heavenly Palace 1) twice during the course of its 15 day mission, Wu Ping, a spokeswoman for China's manned space program said during a briefing on Monday. One docking will be manual, the other automatic, Wu added. "So far we only conducted three automatic docking tests and a manual one," Wu said, according to state-run Chinese news agency Xinhua. "More tests are needed. We also need to further prove that our astronauts are fit for a longer stay in space and the orbiters are able to support their life and work." 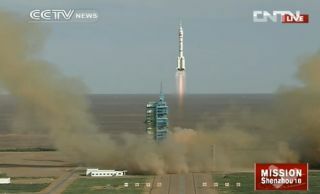 Shenzhou 10 marks China's fifth manned space mission. During their time in space, Nie, Zhang and Wang are scheduled to beam a science lesson down to students on Earth from orbit, and test the performance and efficiency of humans and technology in space. A view inside China's Mission Control center in Beijing during the Shenzhou 10 launch June 11, 2013. The relatively small Tiangong 1 module has been in Earth's orbit since September 2011. The 8.5-ton structure is about half of the mass of the world's first space station — the Soviet Union's Salyut 1 — and the International Space Station is about 400 metric tons by comparison, Marcia Smith, editor of SpacePolicyOnline.com, wrote in a recent posting. The first Chinese three-person crew docked to the Tiangong 1 module in June 2012. Before the Shenzhou 10 mission, eight other Chinese astronauts made the trip to space. The first Chinese astronaut, Yang Liwei, launched into orbit in 2003. Chinese media is reporting that this latest journey marks the last of three planned missions to master space rendezvous and docking. Shenzhou 10 is part of China's plan to gain the experience necessary to build and operate a large space station by around 2020, officials have said. Xinhua has reported that the larger station will be composed of three capsules: Two laboratories and a core unit. The orbiting habitat is expected to weigh more than 90 tons. Both Zhang and Wang have never flown to space before, but Nie flew for just under five days during the Shenzhou 6 mission in 2005. After the United States and Russia, China is the third country to launch astronauts into space on its own vehicles. Follow Miriam Kramer on Twitter and Google+. Follow us on Twitter, Facebook and Google+. Original article on >SPACE.com.